Many nanomaterials exhibit anti-microbial properties and demand for such materials grows as new applications are found in such areas as medicine, environmental science and specialised coatings. 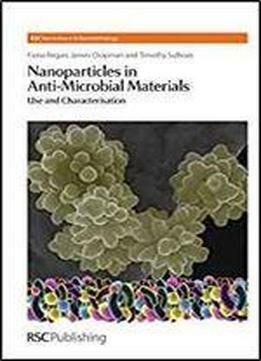 This book documents the most up to date research on the area of nanoparticles showing anti-microbial activity and discusses their preparation and characterisation. Further materials showing potential anti-microbial properties are also discussed. With its user-friendly approach to applications, this book is an excellent reference for practical use in the lab. Its emphasis on material characterisation will benefit both the analytical and materials scientist. Frequent references to the primary literature ensure that the book is a good source of information to newcomers and experienced practitioners alike. Chapters devoted to nanoparticles, microbial impacts on surfaces and molecular biology are essential reading, while chapters on characterisation ensure this book stands out in the field.